The Leicester Comedy Festival 2019! Wowee, it is back for its 26th year, and we are proud to be back as one of the venues offering the most free comedy shows once again! This year you have over 50 shows to choose from here at Manhattan34. More than 95% percent of them are free. To celebrate we’ve created a special menu of cocktails inspired by classic comedy and great funny people past and present! These very special drinks will be available throughout the festival. 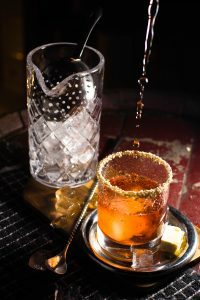 We’ve taken some of your favourite spirits, some exclusive vintages and a dash of the usual Manhattan creativity to make this menu, we know it will knock your socks off. For example, how would you like to get your laughing gear around this little beauty? Laurel and Hardy were a comedy duo act during the early Classical Hollywood era of American cinema. The team was composed of Englishman Stan Laurel (1890–1965) and American Oliver Hardy (1892–1957). They became well known during the late 1920s through the mid-1940s for their slapstick comedy. We’ll let you come in to the bar and discover the rest of the menu for yourself. 9.00pm – 10.00pm Fiona Ridgewell: Even Daisy Needs a Day Off!